As the story opens, The Chipmunks, Chipettes, and their eternally beleaguered guardian, Dave Seville, are en route, on a luxury cruise liner, to the International Music Awards. Alvin, of course, cannot resist wreaking havoc on this ultimate playground. . He attempts to steer the vessel, takes over the hot tubs, and dons a tuxedo – secret agent style – to work the baccarat and blackjack tables. 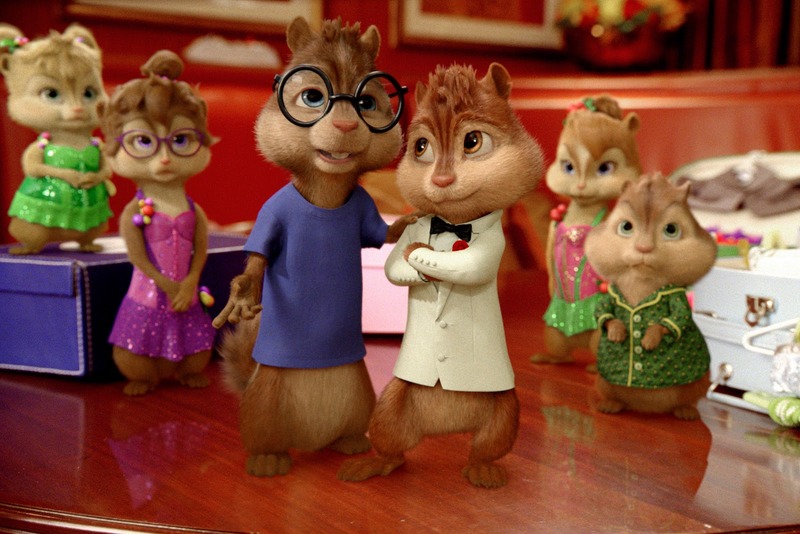 The new home takes the chipmunks completely out of their element after being pampered and domesticated – in the movie, their adventures are amped by heroic scrapes, narrow escapes, and huge escapades. Adding to the adventure is the appearance of a character new to the Chipmunks universe – “Simone,” a swashbuckling Frenchman with a taste for adventure and a lust for life. If Simone looks familiar, it’s because he’s the alter-ego (and polar opposite) of buttoned-up and brainy Chipmunk, Simon, who transforms into Simone after he’s bitten by a tropical spider. (Simon is again voiced by Matthew Gray Gubler while Simone is voiced by Alan Tudyk). “For most of the movie, Simon is not even Simon; he’s Simone. But by the end of this adventure, Simon learns there’s a little bit of Simone in all of us. Simon’s transformation leads to changes for Alvin,” says Gubler. “Simone acts before he thinks; he’s very much about derring-do, no matter what the real-world consequences. In a way, he’s become like a turbo-charged European version of Alvin. So now, to ensure that The Chipmunks make it off the island, Alvin has to step up and be the logical, responsible one. Alvin becomes Simon -- and a little bit, like Dave,” Janice Karman, the movie’s producer further explains. “A key theme in this movie is about the Chipmunks growing up, and how hard it is for a parent – in this case, Dave – to let his kids be independent. But kids (and chipmunks) are going to grow up and they’re going to be independent. It’s inevitable, of course. I think that idea is going to resonate with kids and parents. Everyone can relate to the story, even though it’s a singing/dancing/adventure-seeking Chipmunk movie,” director Mike Mitchell concludes. “Alvin and the Chipmunks: Chipwrecked” opens January 8 (Sunday) in theaters nationwide from 20th Century Fox to be distributed by Warner Bros.